Gom Geshe Jampa Tsundue, Tehor Geshe Lobsang Dhargey and Tse Geshe Jampa Lakmen were appointed teachers for handwriting and prayer memorization. As there was no school building all the classes were held in open ground exposed to heat, rain and wind, making teaching work very difficult. I discussed this problem with Geshe Tashi Bum and we were able to find some fund necessary for School building and finally able to build four classrooms, toilet, and bathroom. (These Rooms were later on used for printing press). We organized a brief inauguration ceremony for the new school building. We invited Ex-Abbot Vajradhara Jetsun Lobsang Wangchuk, Kyabje Khen Rinpoche Jetsun Dhondup Topgyal, Most Venerable Geshe Ngawang Lekden, Eminent scholar Te Geshe Tamding Rabten, and inaugurated the new school building followed by a simple tea party to the guests. The non-availability of English teacher for the student was a big problem. Our own philosophy student Venerable Jampel Sangey volunteered to teach the novices English for several years without receiving any pay. He deserved our heartfelt thanks. I requested Geshe Tamding Rabten to find a sponsor for paying an English teachers’ salary. He was so kind to have been able to find a foreign sponsor who sent rupees 150 (one hundred fifty) as monthly salary for our English teacher. I thanked both the sponsors and Geshela for their help. This teacher salary sponsorship continued uninterrupted even when the school was reorganized in the later years. Then as per previous year’s plan there was a need for a by-law for reorganization of Sera Je School. I requested three foreigners to help me prepare this by-law. Tenzing Choglang (Luca Corona) of Italy, Sangay Samdup and an American monk together they prepared the by-law which finalized after making necessary changes we. I submitted this by-law to His Holiness the Dalai Lama for His kind approval. 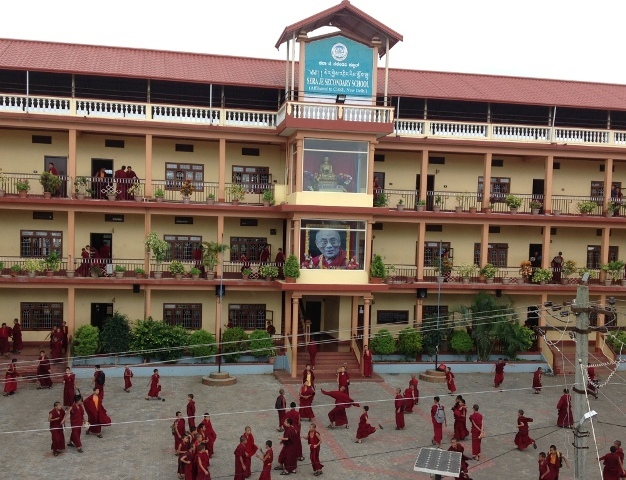 His Holiness so kindly gave us His approval and we reorganized and re-established Sera Je School in 1984. The school is still there. However, our efforts met with various kinds of strong opposition and resistance. Many expressed doubt about its success and some expressed their opposition to re-establishment of the school as a distinct institution. As it is said that where there is holy Dharma, there is also evil demons, we faced repeated pressure against this educational venture. However, I did not give in to their opposition. Fully aware of my own authority, I used it decisively to fulfill the project. In this regard, I must put it on the record that the multi-faceted educational and related construction and fund mobilization for the projects, such as the main school building consisting two stories for classrooms, teacher’s salary, food of the students, staff salary, school kitchen and appliances, office requirements – all were so generously funded by the Italian family of Coronas, Mr. Pinos and Mrs. Welma and their son Tenzing Choglang alias Luka. It is because of only their generous financial support and assistance that it has been possible to materialize all the seemingly impossible educational ventures and projects. For this reason it is beyond even slightest doubt that the Corona families, father, Pinos and mother, Welma, their elder son Masimo and younger son Luca had been actively involved in Sera Jey Monastery’s Dharma activities for the preservation and dissemination of the holy Dharma, and that they had rendered tremendous financial support to the monastery – is clearly the evidence of their extraordinary spiritual energy that had enabled them to support the monastery and the School in such a magnitude. Since inauguration of the school had already been taken place in the past, it was not convenient to organize another inauguration ceremony for the new school complex. Therefore, on 21st October 1984, to mark the successful completion of new school building comprising of office, classrooms and kitchen block, we organized a brief function coincided with birthday celebration of our patron benefactor Venerable Tenzin Choglang alias Ven Luka during which we treated the school benefactors and the staff and the students with special meals. We felicitated our benefactors in the function and expressed our sincere gratitude to their invaluable financial support. As for the school timetable, early in the morning as the monastery assembly bell goes for Morning Prayer, the students gather in the Prayer Hall and after saying Morning Prayer, they had morning tea and bread. Then until 9 O’clock under the supervision of designated teacher, the students engaged in memorization of chants and scriptures. Then morning assembly is held followed by classes. 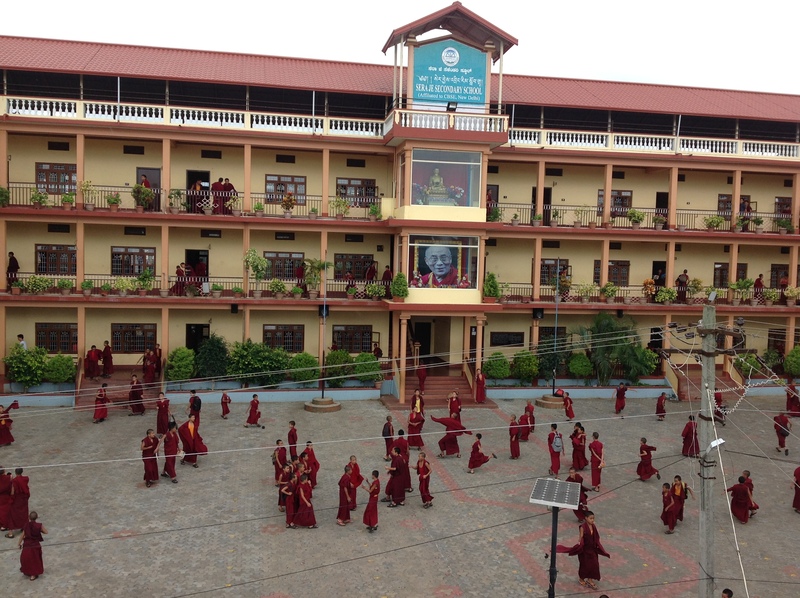 The subjects taught are English, Tibetan Language Reading and Writing Practice, Tibetan Grammar and Spelling Practice, History, Religious History, Mathematics, Science, Religious Teachings, etc. In short, the classes were held in similar way as in all other schools. After supper, again the students devote themselves to memorization of prayers and scriptures till 8.30 PM. A new school regulation had also been enforced in proper following of the above routine schedules. Thus, we could never thank Ven. Tenzin Choglang enough for the success and prosperity of the Sera Je School as a reputed monastic educational institution. During the 1985 ‘Jang-gun’ philosophical study workshop held at Sera, it was our great fortune that His Holiness the Dalai Lama so kindly graced the workshop and during the same time His Holiness gave teachings on Tokjod Dunlekma and Dakpo Sumdil. During this auspicious occasion, it was my great privilege to have been able to present to His Holiness the Dalai Lama the Sera Je School By-law and Memorandum. His Holiness expressed His great pleasure and deeply appreciated the work. Because of this when I and Sermey Khen Rinpoche went to see off His Holiness during His Holiness departure, His Holiness so kindly gave me several instructions on important matters to be accomplished. At that time, His Holiness said that it was very much appreciable that this school had the system of holding Morning Assembly where national Anthem was played and that the school system was excellent. His Holiness further said that based on this we should strive to formulate a uniform school regulations and system in all the three major seats of the Gelug Monastic Universities. It gave me inexplicable joy to knowing that my efforts had brought His Holiness happiness. I accompanied His Holiness up to Bangalore Airport. SJSS admits -each year- a large number of newly escaped children from Tibet and less privileged children from the Himalayan region, such as, Ladakh, Sikkim, Bhutan, Arunachal Pradesh, and Nepal. 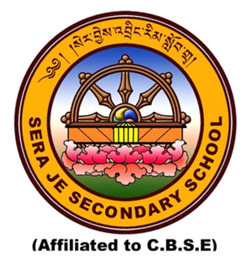 SJSS is affiliated to CBSE (Central Board of Secondary Education, Government of India) since 1997, which is the apex government Board for Secondary education in India. SJSS has 30 Teaching Staff ( in Senior and Junior Section) and 7 administrative staff, 6 staff in School Kitchen, 6 staff in Siddhartha School Canteen, 1 in School stationary shop and 1 staff and 10 weavers in Lotus Carpet Handicraft Center, an income generating unit of the School.